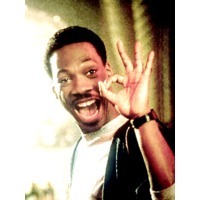 Edward Regan "Eddie" Murphy (born April 3, 1961) is an American stand-up comedian, actor, writer, producer, singer, director, comedian, and musician whose trademark is his laugh. The box office take from Murphy's films makes him the second highest grossing actor in the United States. He was a regular cast member on Saturday Night Live from 1980 to 1984, and has worked as a stand-up comedian. He was ranked #10 on Comedy Central's list of the 100 Greatest Stand-ups of All Time. He has received Golden Globe Award nominations for his performances in 48 Hrs, Beverly Hills Cop series, Trading Places, and The Nutty Professor. In 2007, he won the Golden Globe for Best Supporting Actor for his portrayal of soul singer James "Thunder" Early in Dreamgirls, and received a nomination for the Academy Award for Best Supporting Actor for the same role. Murphy's work as a voice actor includes Thurgood Stubbs in The PJs, Donkey in the Shrek series and the dragon Mushu in Disney's Mulan. In some of his films, he plays multiple roles in addition to his main character, intended as a tribute to one of his idols Peter Sellers, who played multiple roles in Dr. Strangelove and elsewhere. Murphy has played multiple roles in Coming to America, Wes Craven's Vampire In Brooklyn, the Nutty Professor films (where he played the title role in two incarnations, plus his father, brother, mother, and grandmother), Bowfinger, and 2007's Norbit.